We created a spreadsheet with over 1400 data points that allow us to analyze all kinds of angles about the show. Along with the rest of the world, we’re getting really excited about Season 8 of Game of Thrones. It’s a show that is so richly psychological with deep and complex characters, but it’s also just incredibly good. To prepare for it, we’ve decided to do some heavy lifting for you and come up with, what we think you will agree, is the absolute, definitive ranking of the entire first 7 seasons of GOT. We created a spreadsheet with over 1400 data points that allow us to analyze all kinds of angles about the show. When we said this was the definitive ranking, we weren’t kidding. Several legit websites have ranked all 67 articles across the 7 seasons. 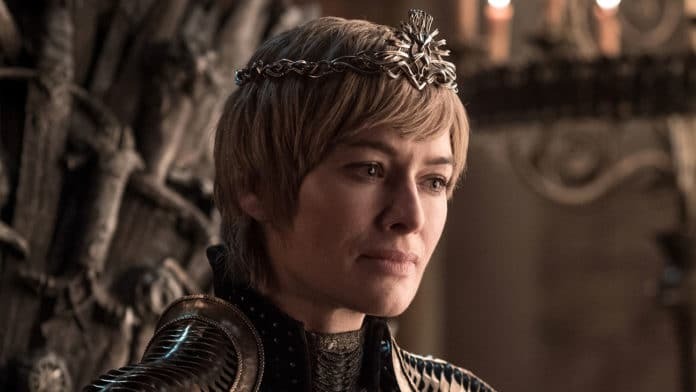 We compiled rankings from 10 websites into a big spreadsheet, crunched the numbers in a pop culture meta-analysis, and now we’re able to give you the definitive ranking of all 67 Game of Thrones episodes. We also added ratings from IMDB and Entertainment Weekly. Before we get to the goodies, let’s acknowledge the amazing work that all of these sites did in watching and evaluating the past 7 seasons of this great show. I encourage you to look at these links to see not only their rankings, but their rationales for why. They don’t all agree, but they give solid reasons for why each episode ranked where it did. 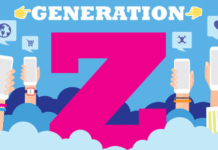 Here are the ten sites that we used, listed in alphabetical order. If you click on each one, it takes you to the episode ranking article, which is definitely worth checking out. We selected the websites based on a few criteria that had to do with clear evidence they were a legit site that actually followed the show and had contributors that could offer informed opinions. Websites or blogs that appeared to copy the rankings of other sites were not considered. We narrowed the list of websites down to ten, then put their rankings in a spreadsheet. 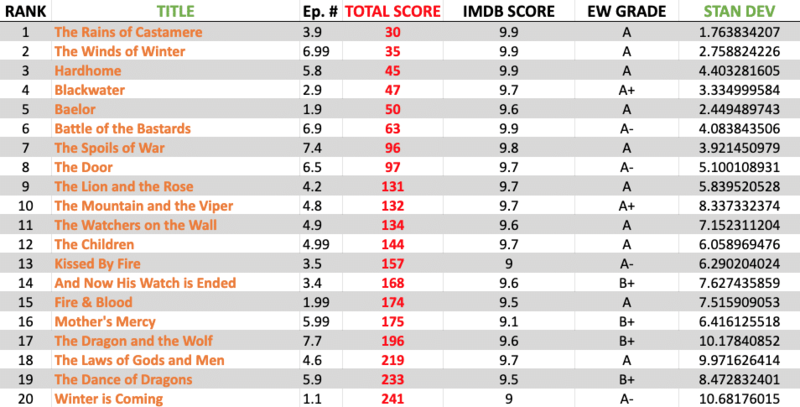 As we mentioned, we also included Entertainment Weekly’s grade (not a ranking) and IMDB’s score (also not a ranking) for additional flavor and analysis. For the overall episode rankings, we summed the number for all ten sites. The lower the number meant the better the episode. So, let’s imagine that if one episode was always ranked last (worst), it would receive a score of 67, which is the total number of episodes. With 10 websites, it’s overall score for the pitiful episode would be 670. Now let’s imagine another episode was always ranked first (best), then it would get a total score of 10 (which is 10 websites each giving a score of 1). The range of the scores would be 10 (perfect, best) to 670 (horrible, worst). We then ran a standard deviation for each episode. What this tells us is how much agreement or disagreement there was for that episode. A Game of Thrones episode with a very low standard deviation across the 10 websites would have high agreement among the raters. That agreement could be in any direction. In other words, most everyone might agree it was good or most everyone rated it a stinker or most felt like it was a pretty middling episode. This allows us to make some statements about episodes that were controversial or ones where there is more of a consensus. Finally, the analysis lets us even look at the quality of episodes from different writers or directors or across seasons. That will be another article for later, though. You’ll see the findings of the analysis below. We’ve included the ranking, episode name, the episode number (Note that episodes that have a .99 are actually episode 10 of that season, so 1.99 is Season 1, Episode 10, for example. It was the best way to keep them in order when we were setting up the spreadsheet), the writers and director, the IMDB score, the Entertainment Weekly grade, and the standard deviation. The actual ranking of the ten websites is not included here for space, but you can see the actual numbers of those sites with the links above. We’re not giving any commentary or description of the episodes here, though we will in some upcoming articles. I will say, though, that I made a list of my ten favorite episodes of the 7 seasons and 8 of the ten matched the top ten here and the other two were not too far off. What you’ll find is that there does seem to be some strong consensus on the show’s rock star episodes. The best have definitely risen to the top. So there you have it. The Rains of Castamere, the legendary Red Wedding episode, comes out on top, just narrowly beating Season 6’s season finale, The Winds of Winter, followed by three brilliant episodes: Hardhome, Blackwater, and Baelor. Another favorite, The Battle of the Bastards, is also right up there. Notice that at least one episode from each season is represented in the Top Ten, with Season 6 having the most (3 of the top ten). There’s also not a single Season 6 episode in the bottom 10, nor is there any from Seasons 1 or 3. Season 5 had the most in the bottom 10 with 4 total. If we consider the range of variability in the rankings (standard deviation), there was a great deal of agreement for nearly all the top ten episodes and for the bottom two episodes. The Rains of Castamere was ranked in the top three episodes for 7 out of 10 sites and was ranked no lower than 7th by any of them. While nearly everyone agreed that Unbowed, Unbent, Unbroken and The House and Black and White were stinkers, there was much less agreement for the bottom ten episodes overall, though. 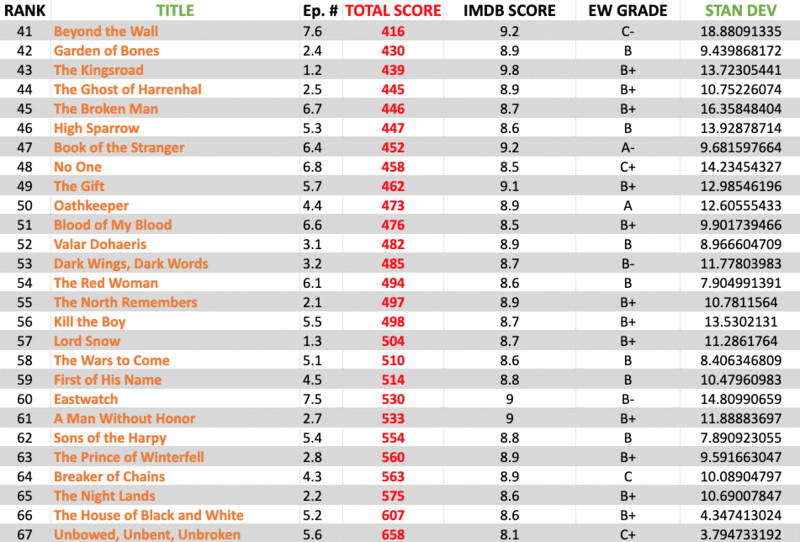 The episode titled Eastwatch was rated as low as 66th and as high as 18th, for example, though most of the scores were low with a couple of outliers. The episodes with the highest level of disagreement (i.e., the biggest standard deviation) were Beyond the Wall with several reviewers rating it as fairly good and others rating it as decidedly bad. The rankings were all over the place. Here’s the array of rankings for that particular episode: 13, 21, 21, 31, 46, 46, 51, 60, 62, 65. To state it plainly, one reviewer thought it was the 13th best episode out of 67 (top 20%) and another thought it was the third worst episode of the whole series (bottom 5%). Close behind, a Season 6 episode called Home was ranked as high as 7th and as low as 63rd. The conclusion I’d draw is that with a few notable exceptions, even the lower rated episodes are still good. IMDB gave its first 8.5 or lower (still a fairly high score) to the show ranked 48th on the list (No One), but gave scores of 9 or better to shows that were ranked lower than that episode, including one that came in 61st on the overall list. Entertainment Weekly gave its first grade of C or lower (of only 3 C’s total) to an episode that ranked 41st (Beyond the Wall), but gave a solid A to an episode that came in 50th on the list. Again, even the lower rated ones are strong. Despite some disagreements, there was a high level of agreement among the overall ratings. We ran a correlation between IMDB’s scores and EW’s grades (converting the grade to a numeric rating) and we found a strong positive correlation between them (r=.6). When we did other analyses, we found that most of the raters agreed more (generally) than they disagreed. How Good Is Game of Thrones? Well, the raters at IMDB can be notorious stingy, but the overall average for all 67 Game of Thrones episodes is a shockingly high 9.1. Very few shows can boast consistent numbers that high. 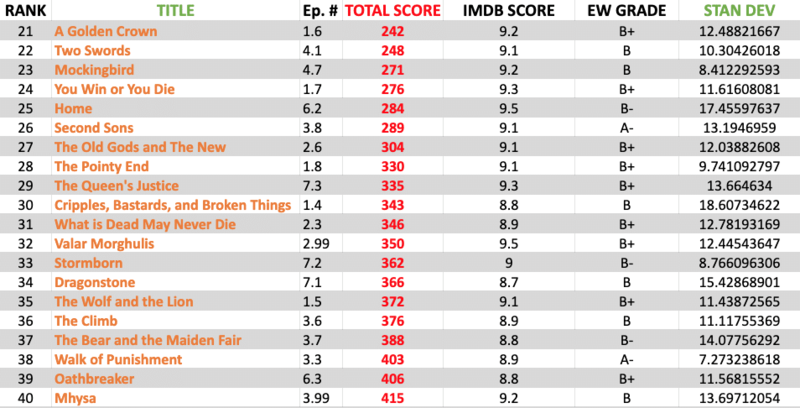 Similarly, EW’s average grade is a B+, which, again, is a high sustained score across 7 seasons. Twenty years from now, there’s no question the show will be regarded as one of the best in television history. With Season 8 looking like it might be the best one yet, that legacy looks like it will be forged in steel. For more analysis and other Game of Thrones coverage, come back to Shrink Tank. Also, make sure to subscribe to our YouTube channel where you can now watch the Shrink Tank Podcast on video.